Since the 1960s, Johnson & Wales University has offered classes on a term calendar. Today, a large majority of U.S. institutions of higher education operate on a semester system. With the start of the 2018-2019 academic year, JWU is offering all graduate degree programs, except for the master’s level education programs, on a semester calendar. The conversion to semesters will be completed in fall of 2020 for all undergraduate, continuing education and master’s level education programs offered at the university. This transition schedule also applies to programs offered through the College of Online Education. The conversion to semesters will positively impact the quality of JWU’s educational experience in many ways. Students will have more time to interact with their faculty as they learn the content and skills of each course and participate in projects. Internships will be longer so students will gain additional experience in their professional field. With future academic years starting approximately in late August and concluding in early May, students will have more time to pursue summer work or study abroad opportunities. For students enrolled in the College of Online Education, an additional set of FAQs have been developed. Students will have more time to pursue summer work and study abroad opportunities. Undergraduate, continuing education, and master’s level education programs will follow a semester calendar starting in fall 2020. Graduate degree programs, except for the master’s level education programs, began following a semester calendar as of fall 2018. What is the difference between the term system and the semester system? The term system divides the year into three, 11-week sessions in the fall, winter and spring. The semester system divides the year into fall and spring sessions, each spanning approximately 16 weeks of instruction. Summer sessions will also be available to students. Please review FAQs for students enrolled in the College of Online Education. All students are encouraged to meet with their faculty advisor or assigned academic counselor in Student Academic Services (SAS) to review a plan that will keep them on track toward graduation. How will converting to semesters impact study abroad? Operating under a semester calendar will only benefit students’ access to study abroad. Many of the university’s exchange partners run on a semester calendar. This will make it easier for JWU students to go on an exchange program without having to take a term off. In addition, more study abroad opportunities will be available through our exchange partners starting in fall 2018 for graduate students. Similar to the academic programs, all study abroad program credits will be converted using the same calculation. Students may still be eligible to apply scholarships and financial aid to study abroad semester, year-long and summer programs. Where can I find the academic calendars? View the 2019-2020 academic calendars. The academic calendars for 2020-2021 will be available in spring 2019. Undergraduate students: Undergraduate academic courses will continue to be scheduled Monday – Thursday under the semester calendar. Courses will be delivered over 16 weeks. Most classes will meet twice per week, each over a 75-minute class period. Graduate students: Master’s level courses are delivered over 8 or 16 weeks, in standard and hybrid formats. 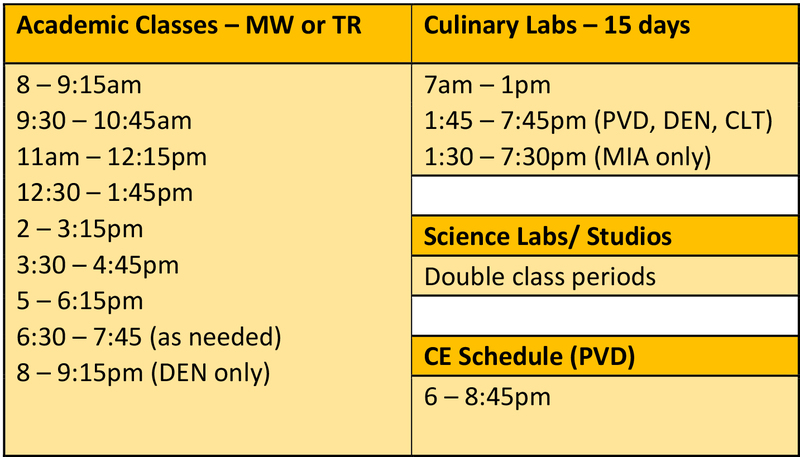 The majority of courses will be offered in the evening from 6-8:45pm, with some scheduled during the afternoon. Standard courses must meet at least 15 times during the 16-week semester. Course content is delivered in a traditional classroom through face-to-face instruction. Hybrid courses must meet at least 8 times during the semester. Over 50% of the course work is delivered in a traditional classroom through face-to-face instruction. The remaining course work is completed online. Continuing Education students: Courses will meet once per week in the evening for 2 hours and 45 minutes. Course workload will be distributed over a 16-week period instead of 11 weeks, providing students more time to complete course work. *This example does not apply to lab hours. No. The annual cost will be the same as it would be under a term calendar. Students will see that billing is different—twice per year instead of three times per year. The university offers several payment options. No. Your financial aid eligibility will not change as a result of JWU transitioning to a semester system, but financial aid will only be disbursed twice per year instead of three times per year. Please note: your enrollment status, being full-time or less, is one factor in determining your eligibility for financial aid. Undergraduate students (starting fall 2020): Students enrolled in a minimum of four 3.0 credit courses, or 12 semester credits, may qualify for full-time financial aid. Students enrolled at least half-time may qualify for financial aid at a reduced rate depending on eligibility (cost and need). Graduate students (as of fall 2018): Students enrolled in a minimum of three 3.0 credit courses, or 9 semester credits, may qualify for full-time financial aid. Students enrolled at least half-time may qualify for financial aid at a reduced rate depending on eligibility (cost and need). The conversion of credits for all course work completed at the undergraduate level and for the master’s level education programs will occur after summer 2020 classes have ended. All courses on an academic transcript will reflect semester credits regardless of when those courses were completed. The conversion of credits will be noted in the legend of the official transcript. How many credits are required to complete a bachelor's degree in four years? A minimum of 120 semester credits is required to complete a bachelor’s degree. In order to finish an undergraduate degree in four years, students must successfully complete 15 credits (or five 3.0 credit courses) per semester. If I am looking to transfer to JWU as a full-time, undergraduate student before fall 2020, will my credits be accepted by the university? The standards to determine eligibility for transfer credit will be the same as current protocol at JWU: 1) coursework taken at an approved institution; 2) the course must be similar in level and content; and 3) student must have a grade of C or higher for an undergraduate course; B or higher for a master’s level course. Learn more about our transfer credit policy in the JWU Catalog. Changing to a semester calendar will make transferring to JWU more seamless for students, as the majority of transfer students come from the semester system. If you have questions or comments, please email semesters@jwu.edu. Current students: Please direct your questions to your faculty advisor or academic counselor in Student Academic Services. It’s important to meet with them to create and continually review a plan that will keep you on track toward graduation.